Pope Francis: Peripheries in the Middle Pope Francis: Is There a Submerged Schism in the Catholic Church? Paradoxically, Pope Francis’s “Back to the Future” adventure happened with his two-step trip to Caucasia, that is, in those lands where history is measured in millenniums, rather than in centuries. It is really looking toward East, to those lands full of history, that one can find the future challenges of Catholicism, for at least four reasons. The first reason deals with ecumenical dialogue. Armenia is the first nation in history that declared itself Christian, and Georgia’s Christian tradition is almost as old. Both of Churches are characterized by a strong independence rooted in history. The outcome is that the two autocephalous Armenian Apostolic and Georgian Orthodox Churches are also a good representation of the huge challenge of ecumenical dialogue. The Armenian Apostolic Church has broken free somewhat from the forced isolationism which labeled its adherents as monophysites. Although doctrinal boundaries between itself and the Catholic Church have been torn down, there is one main obstacle: the primacy of Peter. Founded by the apostles James and Thaddeus, the Armenian Apostolic Church claims its Catholicos as an authority as important as the Pope’s. Primacy is always the harder issue to overcome. Yet, there have been many steps forward on Catholic side, starting from St. John Paul II’s 1995 encyclical “Ut Unum Sint” to the 2007 Ravenna Document, and then to the 2016 Chieti Document. Both of these latter declarations were an outcome of the meetings of the Joint Committee on Catholic–Orthodox Theological Dialogue that has met 14 times (once every two years). The last meeting one month ago in Chieti resulted in the issuance of a document on primacy and synodality, which was not, however, entirely accepted by the Georgian Orthodox Church. In general, we can say that there have been no concessions on the issue of primacy from the hardest Orthodox side, as they insist they are preserving the true faith – though showing willingness to collaborate in dialogue. The discussion is mostly focused on marginal issues with extreme consequences. For example, the complete impossibility for the Orthodox of Georgia to participate to any religious celebration but the Orthodox one. This leads to the celebration of re-baptisms. For instance, if a Catholic wants to marry an Orthodox, the Catholic must first be baptized again, as Catholic baptism is not recognized as the equivalent of the Orthodox one. Bishop Giuseppe Pasotto of Tbilisi put the issue on the table during dialogues he had with representatives of the Orthodox Church in Georgia. He underscored that the fact that Catholic baptism is considered of no value is the same as saying that Catholics are not Christians, because being Christian comes from baptism: a non-baptized person who believes in Christ is a catechumen until the moment he is baptized. 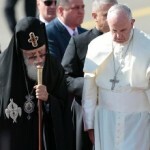 In the end, following the Georgian Orthodox rationale, even the Pope cannot be considered a Christian. This leads to the second reason why the trip to Caucasia was Pope Francis’s “Back to the Future.” The origin of this Georgian “theology of closure” is traced back to the post-Soviet era. After the fall of the Soviet Union, Orthodox theologians raised in Russia carried with them to Georgia the seeds of a sort of “exclusive orthodoxy.” This theology halted Patriarch Ilia II’s march toward rapprochement with the Catholic side beginning in 1980, when – during the Soviet era – he was the first Georgian Orthodox Patriarch to pay a visit to the Pope in the Vatican. That Ilia II is keener to dialogue was proved by the way he welcomed Pope Francis during his recent trip to Georgia. The Patriarch even accompanied the Pope to the plane when he was leaving Georgia, something he usually does not do. The Patriarch is the public character that the Georgian people trust most, and with this gesture he wanted to give a signal. Even the press releases the Georgian Orthodox Patriarchate released before the papal trip have an encouraging tone: they reiterate that the Orthodox were forbidden to participate in Pope Francis’s Mass, but at the same time they distanced themselves from the protests of some Orthodox ultra-traditionalists. However, this Orthodox world, strongly characterized by a theology imported from Russia, is an Orthodox world the Holy See has to deal with. The frontline opened by Patriarch Bartholomew, who as Ecumenical Patriarch is tirelessly working as a bridge among the Christian confessions, is not the only force in the Orthodox world to be reckoned with. The weight of Russian Orthodoxy – which is the biggest single Orthodox Church in the world in numbers – is considerable. This issue must be taken into consideration. Pope Francis’s meeting with Patriarch Kirill is a milestone, something to start from. But the concession the Holy See made on the issue of the Eastern-rite Catholics, whom the Orthodox refer to as Uniates, and especially on Ukraine is, however, dangerous. The Pope later balanced these concessions with a focus and with initiatives dedicated to Ukraine itself. The Russian side tends to make things political, as can be noted by the press release the Russian Orthodox Patriarchate issued after the recent Chieti meeting, which once more emphasized the Ukrainian issue. The topic of the next meeting will be chosen by the Orthodox side, and the Russian Orthodox Church will make its weight count. At the same time, the Patriarchate of Constantinople proved its strength by convoking and closing the Holy and Great Pan-Orthodox Council despite the absence of the Orthodox Churches of Russia, Georgia, Bulgaria and Antioch – this last over a territorial dispute. If Orthodoxy itself is divided, is a real ecumenical dialogue possible? At the moment, it is only possible on pragmatic grounds, and this is the third reason that characterizes Pope Francis’s trip to Caucasia as a “Back to the Future” adventure. Taking for granted that doctrinal issues will not be settled in short time, the collaboration of Christian Churches on shared issues like family, life and charity can be the first common ground. Not by chance, the Catholic Church in Georgia is paid great consideration because of its charitable activities. 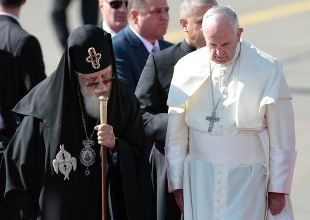 Not by chance, Pope Francis’s visit to the island of Lesbos, Greece, was an ecumenical visit, since the Pope went to the refugee camp together with the Patriarch of Constantinople and with the Primate of Greece. Not by chance, the central theme of Pope Francis and Patriarch Kirill’s joint declaration was about the defense of family and life. That these issues are crucial for ecumenical dialogue was proved by another event. Right after the trip, Anglican Primate Justin Welby made a scheduled visit to Rome, and celebrated Vespers with the Pope in the setting of the Basilica of San Gregorio al Celio. The Pope and the Anglican Primate issued a joint declaration, which did not hide doctrinal differences, but mostly emphasized the need to “pray together.” Prayer and commitment: these are the two Pope Francis’s keys for ecumenism. Being united on these basic issues can put all the Christian confessions on the same side when they come to tackle the big issues of modernity, beginning with the European challenge. The theme of a Europe deprived of its Christian roots is crucial, as ideologies are born out of Europe and later developed in other continents. Despite whatever can be said, Europe is still a cradle of civilization. Even the two recent synods of bishops showed that the hope for the future of Christianity lies in Eastern Europe, the most alert in defending their Catholic tradition and identity against the bureaucrats of the “new rights” – the right to abortion, the right to euthanasia, and so on. From the East of Europe, from the countries of the former Soviet Union, there is also a crucial issue the Church must tackle: Islam. Dialogue with Islam is the fourth reason why Pope Francis’s trip to Caucasia represents all the challenges of the future in one. Azerbaijan is a prevalently Shiite Muslim country, and Catholics there are just some hundreds. Azerbaijan is also reported for violations of religious freedom, and in particular for a certain repression toward the Sunni Islam. But there is also a well-developed dialogue with the Catholic minority that Vatican diplomacy can see as model for the same kind of dialogue in other places. Obviously, the Holy See is working for a wide open dialogue with Islam, as shown by the recent re-opening of relations with the Al Azhar mosque of Cairo, the stronghold of Sunni Islam. Sunni Islam is experiencing interesting developments: the members of the Sunna, in a meeting they had in Grozny, were the first among the Islamic galaxy to certify their complete extraneousness from Wahhabi Islam, the label that mostly applies to extremists. This is the final of the four reasons why Pope Francis’s trip to Caucasia is a real “Back to the Future.” The challenge of dialogue with Islam, pragmatic ecumenism, relations with an aggressive Orthodox theology, the need for Christians to find a new kind of unity around a shared tradition are the topics on which the future of the Catholic Church will be played out. One of the guidelines to play them out are given by the College of Cardinals, as Pope Francis announced a consistory to take place Nov. 19-20. As mondayvatican guessed, the Consistory will close the Extraordinary Holy Year for Divine Mercy. Pope Francis will create 13 new voting cardinals plus 4 non voting cardinals. A wider and more in depth analysis will come next week. However, at first sight a general Pope Francis’ approach can be glimpsed. Despite his wish to represent all the continents and countries possible, Pope Francis prefers bishops who do not act as cultural warriors, no matter if this lead them not to stand out when their priests or fellow bishops are attacked or where secularization erodes the principles of religious freedom. Despite what the Pope thinks about the main issues, he prefers a pragmatic approach. That pragmatic approach that seems to be the chosen way to carry forward ecumenical and interreligious dialogue.